It’s the hat i made for Hubby last year. So i had to knit a replacement. 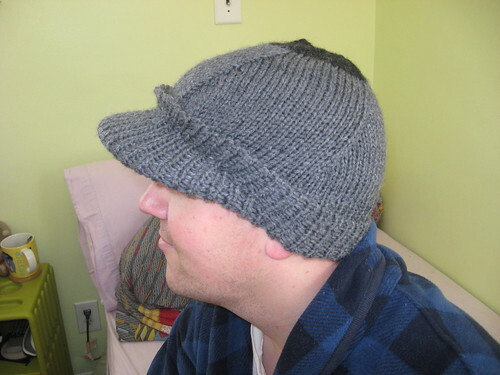 I sent Hubby to Ravelry and made him pick out a hat pattern he liked. Yarn: Wolle Rodel Universal and just a tad of Cascade 220 because i ran out of yarn. Notes: The pattern is written for a 20 inch head-Hubby is 23 inches. So instead of 80 sts i cast on 92. It fits perfectly 🙂 Other than that no changes. 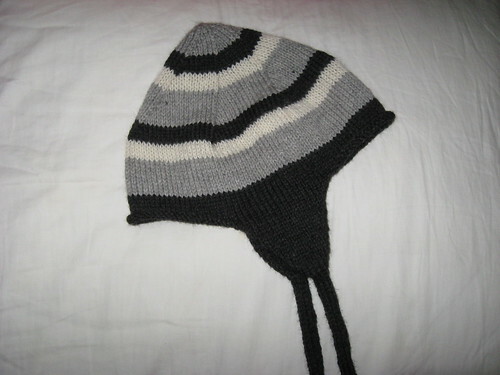 I took a chance and used the yarn i had in my stash and i did run out and finished the hat with some scrap yarn. When Lane is just standing normal you don’t even see the dk. grey and so he took the hat as is-otherwise i would have went and bought some yarn and remade the hat. You use plastic canvas for the brim, for some extra padding and to keep it from snagging the yarn i wrapped the plastic canvas with some this cotton batting. The brim of the hat was a bit tricky to sew in and i had to redo it once. Just make sure when you are pinning it into place that you keep rechecking and making sure your staying even. Lots of pins will help keep it in place while seaming as well. This was an easy knit, very cozy and came out great. I am very happy with the pattern and would make it again. Of course daddy’s stuff is always so cool. And Little Man had to pose as well. 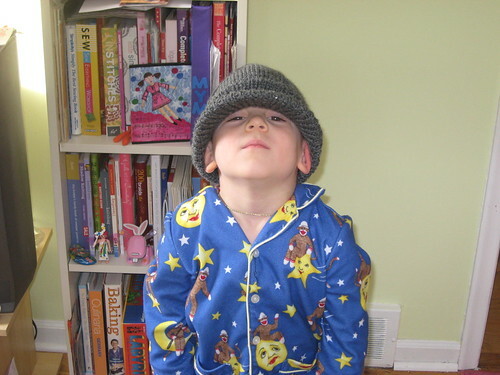 Here is Little Man being silly with Daddy’s hat. Great pick too! Hate you ran out of yarn! Too cute @ little man! It would appear that bloglines hiccuped and I finally discovered that you have been posting. I’m glad to hear that your eye is all better and you are free to do as you wish. And doing you have! Shaun the Sheep and the goat are adorable. Some time I should try knitting a toy. Your Cosima sweater is beautiful and looks fabulous on. The bathmat is so pretty. 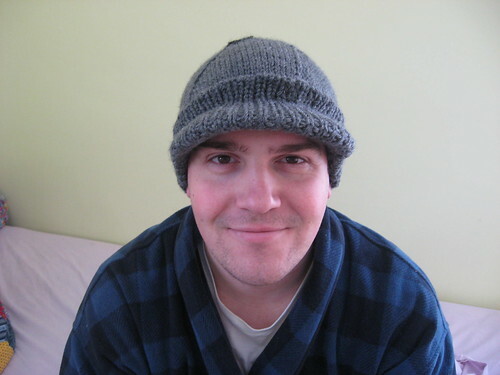 Sorry about the first hat you knit for your husband but the new one is wonderful. Great idea with the plastic canvas for the brim.